I hear this and I automatically grasp frantically at my stomach. Son of a bee sting. My pump is leaking. My pump machinery is connected to a 26ish” tube that is attached to a little sticky thing that has a tiny tube about as small in circumference as a needle is, which is then inserted at my stomach or hip area for 3-4 days. Sometimes the sticky part can get loose towards the end of the cycle, and in turn can make the tube portion come out of my body and the insulin I should be getting on my insides is leaking onto my skin and a “hospital/medicine” smell ensues. I don’t always catch onto it right away because I’m used to the smell of insulin. It smells like…insulin or a hospital if you so choose. On that note, I hope I don’t always smell like a hospital. I don’t think I do. Do I? Back to the post… Think of a Band-Aid being on you for a few days. Life happens, it loses its sticky goodness after awhile. 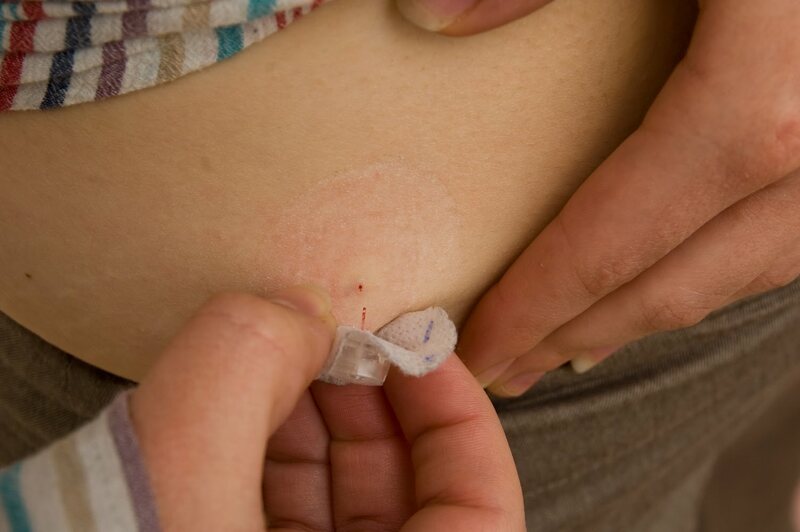 My pump sticky thing is stronger than a Band-Aid, but maybe you are getting the picture? I feel like your eyes are starting to glaze over and you are thinking about some random acts that happened to you today. Maybe you are wondering if you turned the stove off or other such nonsense. Well, stop. I’m trying to explain things here in an unintelligent manner. Geez. This is not me. I found it on the internet and I’m not trying to gross anyone out, but perhaps this gives you the jist…a picture is worth a thousand words, right? 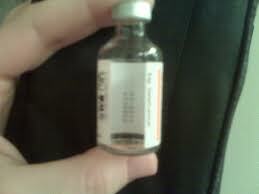 It’s very frustrating when I lose insulin. That stuff isn’t cheap! 3 teeny tiny bottles of it is around $400 and lasts about 3 months…for me at least. Luckily I have insurance that covers it 100% after my deductible is met. Are you starting to see why insurance is so important to me? My pump itself cost around $6,000. The supplies that go with it are probably around $400 – $600 every 3 months, not including the insulin itself. My new continuous glucose monitor thing-a-ma-bobber (I call him “Bob”) involves sensors that are inserted every 3-6 days and they are roughly $42 each. Blood testing strips cost an arm and a leg. It’s crazy how much money this stuff costs. I don’t want anyone to feel sorry for me. I’m lucky and have good insurance, but some don’t and I can’t even imagine what they are going through…well, I can imagine I’ve had my fair share of insurance worries. It’s a punch to the gut. Or maybe a good wallop to the face. Hims just a little guy.